Our Needs | Sowing Seeds Here and Now! We’re trying to keep the costs of this event as low as possible, and want to make our needs known! – We need fiscal sponsorship for this summit to cover the costs of this summit. – If you cannot sponsor with money, please consider an in-kind donation. Anything that will keep our costs down is a helpful. Please see this spreadsheet for an up-to-date list of our needs. 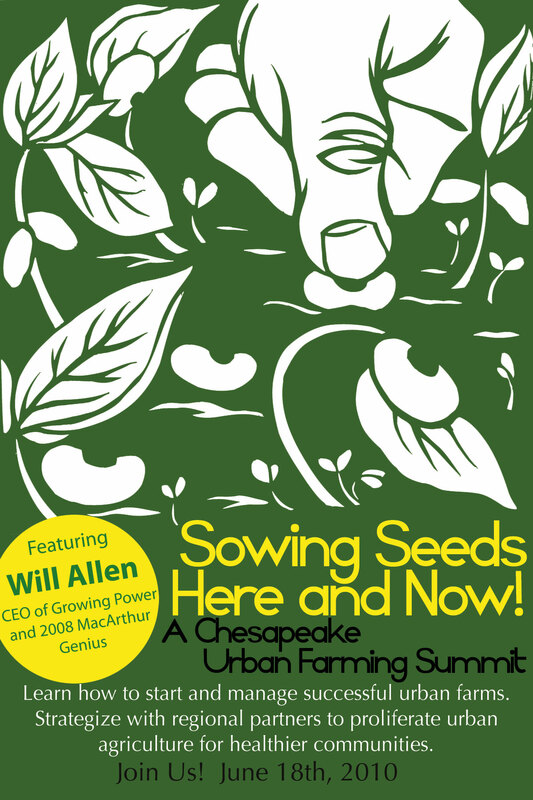 – We need original, engaging, and thoughtful workshops that bring participants together to identify and break down barriers to urban agriculture in the Chesapeake area. If you’d like to propose a workshop, please fill out this form by May 1st. – We can’t rely on just blogs and listserves to promote this summit. We’re printing thousands of postcards and need them distributed to your community. If you can do this, fill out this simple form, and we’ll send you postcards on or around May 3rd. All you have to do is put them up at your mosque, church, or synagogue, your grocery store, coffee-shop, school, or library. Here’s what the postcard’s gonna look like to get you excited! Thanks so much Nikki McClure (!) for hooking it up! – Can you help out during the summit? We’re going to need lots of volunteers from June 16th through June 20th, volunteers for the logistics of the summit. We’d love your help! If you can, fill out this simple form and we’ll contact you when we get closer to the event. If looking for outdoor venue for a training or fund raising event, please contact Tony Cohen, Founder of Menare Foundation in Germantown, MD. Try MenareFoundation.com. Spike Gjerde owner and Chef of Woodberry Kitchen is interested in helping you. You should contact him. How large of a venue are you looking for? I find that when so much effort goes into organizing an event with an outside speaker that it would be good to video tape the event for future reference. If Mr. Allen would agree, I could set up a simple camera and record his talk, and possibly other talks during the day. Would the organizers be interested in this?